Verizon announced its shared data plans Tuesday but while the offerings may remove some of the confusion of using multiple devices on the Can-You-Hear-Me-Now network, the pricing may still seem steep to some consumers. If you thought the plans would emulate a home connection, you were in for some disappointment. With a home plan, you set up your WiFi network, pay a monthly fee and you can connect as many devices as you want to the network without incurring any additional charges. With Verizon's shared data plans, you pay by the device for your access. So if you have one smartphone in the plan, you're going to pay $40 for that phone's monthly access to the network, plus $50 for 1GB of data. Add a phone, and you pony up another $40 a month. Add a tablet, pay $10 more; a wireless hotspot, netbook or laptop, another $20. It's obvious that the fewer devices you include in the plan, the less you'll be paying for service. Of course that doesn't address your need to use the network with multiple devices. But what if you could have a single device—your smartphone—become a proxy for other devices such as a tablet and a notebook? That's what the Asus PadFone does. It’s an Android smartphone that slips into a compartment behind a display panel to become a tablet. 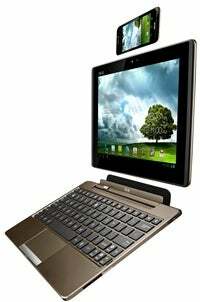 The tablet can then be docked with a keyboard to create a notebook computer. With the three components in the notebook configuration, they form a nice, tote-able package. Right now, the PadFone is only available in Taiwan, although two of the pieces—the phone and tablet—are listed online for $860. Certainly devices like the PadFone aren't likely to be a favorite of carriers as they move to their shared data structures. Verizon, for example, would lose $30 a month from a PadFone customer—$20 for netbook access and $10 for tablet access. Nevertheless, rumors are that the next carrier expected to introduce shared data plans, AT&T, is interested in adding the PadFone to its offerings. If the PadFone gets some traction—and given the general negative feelings of consumers toward all-in-one devices, that's a big "if"—the form factor could become a favorite of consumers willing to trade choice for lower data costs.